Many African students chose to pursue their education in this country because it’s peaceful and the fees affordable. Of late, however, their presence has been viewed negatively simply because some were involved in criminal cases. The majority appeal for more understanding, saying it’s a case of one rotten apple spoiling the whole barrel. KUCHING: They are here to pursue their studies. Some are eyeing career opportunities. They chose Malaysia to either further their study or work not only because it is more affordable but also because they felt that it is more peaceful here. These are the genuine African nationals who have come here legally, striving to gain better education and profession. 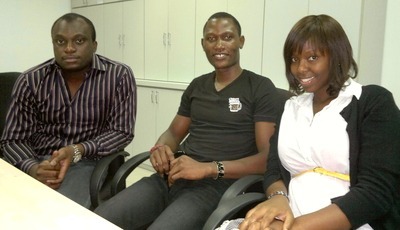 Real deal: (From left) Dabibi, Ernest and Joan in Malaysia pursuing their dreams. According to last year’s statistics from the police, there were about 25,000 African students pursuing their studies in the country. Joan Akatukunda from Uganda is one those people. She has been studying at a private college here for two years now. “Studying here would give me the good exposure especially in the international field as Asia being the most strategic region in the world. “Also, there is a wide range of accredited courses and programmes here to choose from at affordable fees,” the 22-year-old told The Star. Unfortunately, a few bad apples do spoil the whole cart. Due to faults of some individuals, the locals had labelled the whole African nationals living and studying here as criminals and troublemakers. In recent years, the mainstream media had been highlighting crime cases involving Africans possessing dangerous drugs and conning locals to become drug mules, even as these cases were isolated ones. It made the situation even more uncomfortable for the students. Joan said some of her fellow African friends had been the subject of such labelling. “They (the Africans) felt uncomfortable with it, although not obviously. But what can we do? We have to adapt in order to pursue our studies till the end,” said Joan, while admitting that she had never personally experienced any discrimination while she was here. “I think locals have that negative perception towards us Africans here due to lack of understanding, and the overly blown-up news of Africans committing crimes here,” she believed. “I plead to the locals to have an open mind and be friends with us to understand us more. Not all of us are criminals,” she said. Recently, a joint-operation by the police and the Malaysian Anti-corruption Commission (MACC) called “Ops Awang Hitam” was carried out to round up foreigners in the city who did not bring along their passports and visit passes. The move by itself was quite routine where the authorities took those who did not bring their documents to the police station. But the African students cried foul when one of them was handcuffed while the other Caucasian foreigners were treated gently. Dabibi Biokpo, a 25-year-old Nigerian believed that while the authorities here were doing a good job, he felt that locals have the negative perception of Africans here probably because of com- munication barriers and lack of understanding. “Look at my class, for example. My assignment group consists of many local Chinese. We get along very well and in fact, have done quite well in all our assignments and projects. We are very closely knitted. “I would suggest maybe the authorities take this model into the real world outside. After all, real life involves people working together to achieve something, like African investors doing investments in Malaysia,” he said. Dabibi, who is in his final year in degree in robotics and mechatronics here, said it would not hurt if locals could just greet foreigners politely, particularly the Africans. “It is sad that just because of some isolated crime cases involving Africans, we are all being labelled as bad. Not all of us are like that. It’s the same in other countries; crimes are committed everywhere by many nationals,” he said. Meanwhile Ernest Akuomeuku, 25, also from Nigeria believed that people have the right to make judgements. Ernest has been here for about three years pursuing a degree in computer science at a private college. “Of course it is only human for us to judge each other and fear what is foreign because of lack of understanding. However, I believe locals need to have open minds. Interact with us and not just look and judge us from afar. “Malaysians are friendly people; please keep it that way. If we do wrong, tell us and we will do our best to understand and change,” he said.